The Learning Technology Environment Renewal project has been ongoing since summer 2016, guiding UBC’s transition to a new learning management system for courses. On June 8, 2017, Canvas was announced as the replacement for Connect. Project updates will continue to be added to this page as the implementation of Canvas at UBC continues. If you’re a UBC instructor who would like more information about Canvas and UBC’s transition from Connect, please visit faculty.canvas.ubc.ca. This website includes Canvas news and tips, information about training and support, and updates on learning tool integrations. Students who are new to Canvas can access information about UBC’s transition to Canvas, as well as useful Canvas tips, at our Canvas website for students: students.canvas.ubc.ca. Connect was permanently decommissioned on Feb 1, 2019, and is no longer be available to students, faculty, or staff. Canvas is UBC's new online learning platform. Canvas was first announced as Connect's replacement on June 8, 2017. Faculty members who have questions about Connect's decommissioning or about getting started with Canvas should get in touch with their faculty's Instructional Support Unit (UBC Vancouver) or the Centre for Teaching and Learning (UBC Okanagan). Faculty can also get in touch with the Learning Technology Hub for assistance. This website also provides information about Canvas training and support available to faculty and news and updates about Canvas. Students can learn more about our new platform at UBC's Canvas website for students: students.canvas.ubc.ca. This site includes a Canvas FAQ and a blog with Canvas tips, written by students on UBC's Canvas implementation team. Students who encounter technical problems while using Canvas should contact the UBC Information Technology Service Centre for assistance, using their online form. UBC's selection of Canvas was informed by university-wide consultations led by faculty and student teams and through feedback from students and faculty who evaluated possible replacements for Connect through pilot courses and usability testing. Canvas offers a user-friendly interface, a mobile app, and tools that instructors can use to save time and to enhance their teaching. Learn more about Canvas features and tools. UBC has moved to Canvas, and the time has come for the university to officially dis-Connect. 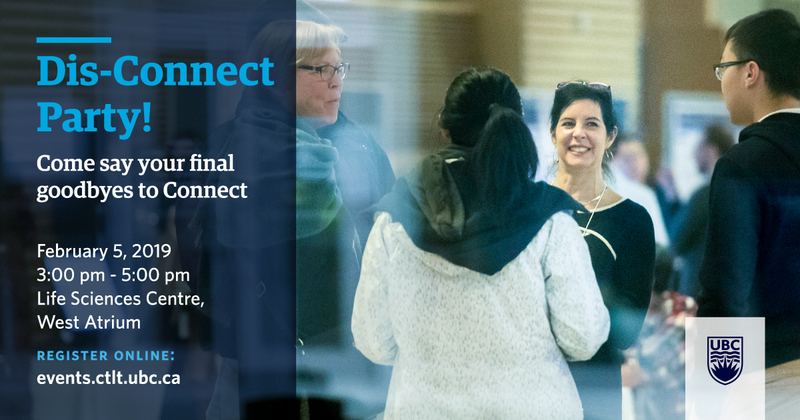 To mark this occasion, faculty and staff are warmly invited to come celebrate the end of the Connect era at UBC’s Dis-Connect Party on Feb 5. This our chance to say a big thank you to everyone who dedicated their time and skills to transitioning from Connect to Canvas. We’re looking forward to continuing to work together to enrich UBC’s learning technology ecosystem. We hope you can join us as we say our final goodbyes to Connect. Please RSVP here. If you've taught courses in Connect that haven't yet been transitioned to Canvas, now is the time to save your course content and make the move to our new platform. As of January 31, 2019, Connect will no longer be accessible to faculty or staff. Do you still have courses on Connect? Learn more about saving your Connect course content from our step-by-step guides to exporting course content from Connect and importing course content into Canvas. If you have questions about Canvas or about transitioning from Connect, we highly recommend contacting your faculty’s Instructional Support Unit (UBC Vancouver) or the Centre for Teaching and Learning (UBC Okanagan). You're also invited to call, email, or drop by the Learning Technology Hub for help with Canvas. Are you new to Canvas? Canvas training and support is available for UBC instructors, TAs, and staff. If you're based at UBC Vancouver, you'll want to sign up for the All-Day Drop-in Canvas Studio on January 2. Check out the full list of Canvas resources, including drop-in help, at UBC Vancouver and UBC Okanagan. This is a friendly reminder that UBC is retiring Connect on August 31, 2018. After August, Connect will no longer be available for teaching courses. If you've yet to make the transition to Canvas — our new online learning platform — or if you still have older course content stored on Connect, please ensure you have a plan in place for transitioning your courses to Canvas. If you're still using Connect and have questions about transitioning to Canvas, please get in touch with your faculty’s Instructional Support Unit (UBC Vancouver) or the Centre for Teaching and Learning (UBC Okanagan) as soon as possible to put together a plan for moving to Canvas. The Learning Technology Hub is also available to help. Canvas training and support is available for UBC instructors, TAs, and staff. Please see the full list of Canvas resources, including drop-in help, at UBC Vancouver and UBC Okanagan. Connect course content will be archived as of September 2018, so we recommend downloading any Connect courses you would like to retain before September. For more information about downloading your Connect course content, check out our step-by-step guides to exporting course content from Connect and importing course content into Canvas. After September 1, instructors will be able to access their archived content by submitting a request to the Learning Technology Hub. Connect course content will remain available to instructors by request for at least one year. If you have any questions about Canvas or about transitioning from Connect, we recommend making your faculty’s Instructional Support Unit (UBC Vancouver) or the Centre for Teaching and Learning (UBC Okanagan) your first point of contact. You’re also very welcome to call, email or drop by the Learning Technology Hub for assistance with Canvas. For any instructors looking to get an early start creating their Winter 2018/19 Canvas courses, course shells have now been created in Canvas for all courses listed in the UBC course calendar. Instructors, teaching assistants, and students will be automatically added to each Canvas course, based on the information in the Student Information System and Scientia. Simply log into Canvas and your courses will be there waiting for you! Please note that your courses won't be accessible to students until you publish them. Learn more about Mass Course Creation. If this will be your first time teaching with Canvas, we highly recommend getting started by connecting with your faculty’s Instructional Support Unit (UBC Vancouver) or the Centre for Teaching and Learning at ctl.helpdesk@ubc.ca (UBC Okanagan). Canvas training and drop-in support is also available at the UBC Vancouver campus and at the UBC Okanagan campus throughout Spring and Summer 2018. As you may be aware, UBC will have completed the transition from Connect to Canvas at the end of August 2018. As of September 2018, Connect will no longer be available for teaching courses. If you haven’t yet moved your Connect courses to Canvas and do not have a plan in place for doing so, please contact your faculty’s Instructional Support Unit (UBC Vancouver) or the Centre for Teaching and Learning (UBC Okanagan) for assistance. How do I build my courses in Canvas? If you’re new to Canvas and need assistance transitioning your course content from Connect or building your courses from scratch in Canvas, please contact your faculty’s Instructional Support Unit (UBC Vancouver), the Centre for Teaching and Learning (UBC Okanagan) or the Learning Technology Hub. Course shells will be automatically created in Canvas several months before the start of each term for every course that’s listed in the UBC Calendar. Learn more. How can I learn more about using Canvas? Canvas training and support is available to all UBC instructors. Please see the full list of resources. This website -- faculty.canvas.ubc.ca -- provides information about Canvas tools, support and training, as well as Canvas news and tips. If your students will be using Canvas for the first time, you may wish to direct them to UBC’s Canvas website for students: students.canvas.ubc.ca. All Connect course content will be archived as of September 2018. After September 1, instructors will be able to access their archived content by submitting a request to the Learning Technology Hub. Connect course content will remain available to instructors by request for at least one year. To ensure that you continue to have access to your Connect course content, we recommend downloading any Connect courses you would like to retain before September 2018. For more information about how to do this, check out our step-by-step guides to exporting course content from Connect and importing course content into Canvas. We’re pleased to announce that Canvas mass course creation is now up and running. This means that each semester, a course shell will be automatically created in Canvas for all course sections listed in the UBC course calendar. Instructors, teaching assistants, and students will be automatically added to each Canvas course based on the information in Scientia and the Student Information System. Courses that are automatically created in Canvas cannot be accessed by students until published by the instructor. In general, courses will be automatically created in Canvas approximately two weeks after the UBC course calendar has been published. For 2018/19 Winter Term 1 (September–December 2018), course shells will be created toward the end of May 2018. If you'd like to start working on your Canvas course before the calendar is published, please contact your faculty's instructional support unit (UBC Vancouver), the Centre for Teaching and Learning (UBC Okanagan), or the Learning Technology Hub to get your course created ahead of time. It will no longer necessary for faculty members or instructional support staff to request the linking of Canvas courses to the Student Information System, provided the course is included in the UBC course calendar. Mass course creation does not create Canvas shells for lab or tutorial sections automatically. If you would like to have lab or tutorial sections created for your course in Canvas, please contact your faculty's instructional support unit (UBC Vancouver), the Centre for Teaching and Learning (UBC Okanagan), or the Learning Technology Hub. The LTE Renewal Team launched UBC's Canvas satisfaction survey to learn more about what the UBC community thinks about Canvas and where additional support might be required. To ensure more of UBC's Canvas users have a chance to provide feedback, we've extended the survey deadline until Wednesday, May 2. Faculty, TAs, and staff can take UBC's Canvas satisfaction survey here. If you're a UBC student who uses Canvas, please take our Canvas survey for students. Our sincere thanks to everyone who has taken the survey! As UBC’s transition from Connect to Canvas continues, we want to know what the UBC community thinks about our new online learning platform. If you’re a current Canvas user, you’ll have likely seen an announcement in Canvas inviting you to take UBC’s Canvas satisfaction survey. Thank you in advance for taking the time to share your thoughts. Students will be invited to share their feedback through a Canvas survey that will be made available via a global announcement in Canvas on April 10 (after the Student Evaluations of Teaching are complete). The Canvas project team is continuing to add more external tools that can used with Canvas — last term, this included tools such as UBC Blogs and iPeer. If you’re currently using Canvas or will be next term, check out the full list of tools that have (or will) be added to Canvas. We’re also excited to announce that we’ve launched a new website in support of Instructional Support Staff (ISS) who work with Canvas: iss.canvas.ubc.ca. This site provides technical and procedural information about Canvas, such as known technical issues and ISS-specific course setup information, and is intended to complement UBC’s Canvas website for instructors and our Canvas website for students. UBC will have completed the transition from Connect to Canvas by the end of August 2018. as of September 2018, Connect will not be available for teaching courses. Instructors who have questions about Canvas or about how to make the transition from Connect are encouraged to contact their faculty’s Instructional Support Unit or the Learning Technology Hub. Finally, whether you’re new to Canvas or are now an experienced user, we encourage you to check out the full list of Canvas training and support that's available to you. Winter Term 2 has begun, and faculties have made significant progress in transitioning to Canvas. Over 2,500 UBC course sections have now been added to Canvas since it was first announced in June 2017 as UBC's replacement for Connect. Each faculty has developed its own timeline for how and when courses will be transitioned to Canvas, but it’s important to note that Connect will not be accessible for teaching courses after August 2018. If you have questions about Canvas or about when and how you can transition from Connect, please contact your faculty’s Instructional Support Unit or the Learning Technology Hub. Instructors who have yet to try Canvas—and experienced Canvas users—have access to training and support through the Learning Technology Hub (UBC Vancouver) or the Centre for Teaching and Learning (UBC Okanagan). Please see the full list of Canvas training and support for more information about all of the Canvas resources that are available to UBC instructors. If you’re teaching students who are using Canvas for the first time this semester, they can learn more about the new platform at UBC’s Canvas website for students. This site includes links to helpful resources for students and a blog with Canvas tips written by UBC students. UBC’s Canvas Project Team is excited to provide you with an update on our progress in implementing Canvas. For Winter Term 2, we’ve been focused on improving Canvas functionality, adding new features and tools to Canvas, and transitioning courses over from Connect. Following testing and validation, a number of new tools and features were added to Canvas on December 14 and December 21. Five additional tools can now be used with the Canvas platform: CoursEval, iPeer, PeerScholar, UBC Blogs, and Webwork. To view the current list of implemented and planned Canvas tool integrations, please visit the tools page on the Canvas website for UBC instructors. The People page has been activated for students. This enables full functionality of Canvas’s Groups tool. If you choose to enable the People page in your course, your students will be able to create their own study groups and to self-enrol in groups you create in Canvas. Learn more. If you teach non-credit courses, you now have the option of enabling self-enrolment. Once enabled, your students will be able to self-enrol in your non-credit class, provided you send them a “join URL.” Visit the Canvas Guides for more information. Threaded discussions have a new look. Vertical bars have been added to the left side of threaded posts to indicate the level of response. Learn more. Two new features that are currently in beta testing have been made available in Canvas: Quizzes.Next (beta) and Canvas's New Gradebook (beta). While these tools offer some promising new features, please be advised that they're both still in development and may not perform as expected. Please contact the Learning Technology Hub or your faculty’s Instructional Support Unit if you have questions about using these tools in your courses. Due to unforeseen issues, Turnitin has not yet made it into the Canvas production environment. The Canvas Project Team will be performing investigations for this integration and will update the Canvas Tools page once we have a new timeline for deployment. If you’re new to Canvas or would like help taking your Canvas course to the next level, please check out the training and support that’s available to you. We also invite you to share your thoughts about Canvas with us at any time using our feedback form. We’re excited to announce that the People page will be activated for students before the start of Winter Term 2. This will enable full functionality of Canvas’s Groups< tool, including the ability for students to self-enrol into groups. The People page displays the names of students enrolled in a Canvas course, allowing them to create their own online study groups and to self-enrol in groups that instructors create in Canvas. Learn more about using the People tab as an instructor at the Canvas Guides. Instructors will need to enable the People page in their courses in order for students to be able to create their own Canvas study groups or to self-enrol in groups. Since these are new functions in Canvas, you may want to direct your students to UBC’s Canvas student blog post on navigating groups in Canvas or to the Canvas Guides on using the People and Groups tools as a student. Since the successful soft launch of Canvas this September, the Learning Technology Environment Renewal Team has been continuing to work towards the full implementation of our new online learning platform. Instructors who have been waiting patiently for a particular tool to be integrated with Canvas can now check out the updated tool integration timeline to see the full list of Canvas integrations that we’re aiming to have ready for January 2018. As you’ll see on this list, we’ve set some ambitious goals—we plan to integrate a total of twelve tools with Canvas by the start of next term. Our top priority will be to have ready a number of tools that are in high demand, including iPeer, UBC Blogs, CoursEval, and WebWork. Our list of planned integrations also includes a number of “tentative goals.” We hope to have tools such as Crowdmark, Turnitin, and VoiceThread added to Canvas by January, but it’s important to note that unexpected technical issues may cause delays for some planned tool integrations. If you’re looking for Canvas resources, UBC has a new central landing page for all things Canvas: about.canvas.ubc.ca. From this page, users can log into Canvas or visit UBC’s Canvas website for students or the website for faculty. UBC’s first courses are now running in Canvas. Nearly 1,000 course sections are being offered in the new system this fall, with more scheduled to be added each term throughout the 2017/18 academic year. To help keep students and faculty informed about Canvas and about UBC’s transition from Connect, the Learning Technology Environment Renewal Team has put together a website for instructors (Canvas at UBC), as well as a website for students (A UBC Student's Guide to Canvas). Our website for instructors includes Canvas news, links to online and in-person Canvas training and support resources, and an FAQ. Our projected timelines for future Canvas tool integrations will also be added to the Canvas Tools page as this information becomes available. We’re happy to report that all of the following tools were added to Canvas for the first day of classes: Kaltura, iClicker, Piazza, ComPAIR, and Library Online Course Reserves (LOCR). Please note that when accessing LOCR in Canvas, users will be redirected to courses.library.ubc.ca and will need to log in again with their CWL. Our team is working to resolve this technical issue. If you have questions about using Kaltura, iClicker, Piazza, ComPAIR, or LOCR, Canvas-specific tool guides have been added to the Canvas Tools page on the Canvas at UBC website and to the Tool Guide section on the Learning Technology Hub website. If you need help with Canvas, please check out the training and support that’s available to you. We also invite you to send us your thoughts about Canvas at any time using our feedback form. Finally, thank you to everyone who has participated in the Canvas soft launch. UBC first selected Canvas in June, and our steady progress wouldn’t have been possible without your knowledge, input, persistence, and dedication. We’re excited to announce the soft launch of Canvas—the learning management system that will be gradually replacing Connect at UBC. If you’d like to try Canvas out now, we recommend first checking in with your faculty’s Instructional Support Unit (UBC Vancouver) or the Centre for Teaching and Learning (UBC Okanagan) to learn more about the soft launch phase and your faculty’s plan for transitioning from Connect to Canvas. When you’re ready to create your account, please visit https://canvas.ubc.ca and enter your CWL login. Presto! You now have an account in Canvas. Please note that during the soft launch phase, courses cannot be automatically added to instructors’ Canvas accounts. To have your courses added to Canvas, please get in touch with your faculty’s Instructional Support Unit or the Learning Technology Hub. As we’re still in the process of implementing Canvas, not all features and tools are ready to go. At the moment, we’re testing and configuring Kaltura, iClicker, and the Library Online Course Reserves (LOCR). You can count on these tools being integrated by September 2017, but for the time being they may not function as expected. Some third-party apps and tools will be integrated with Canvas after September 2017—including Piazza, Blogs, edX, peerScholar, iPeer, and WeBWork. The ability to add textbook publishers’ online content to Canvas will also be ready at a later date. You may wish to delay transitioning to Canvas until these features are ready to go. Please stay tuned for more information about when we expect these integrations to be completed. Once you’re active in Canvas, you’ll have access to email, chat, and telephone technical support provided by Canvas representatives, which you can access by clicking “Help” on the global navigation menu. This support will be available to faculty and students 24/7/365, throughout the implementation period. We’ve also put together an expanded list of training and resources designed for faculty, including an updated FAQ. We really hope you enjoy using Canvas! If you have any questions about Canvas or the transition from Connect, your faculty’s Instructional Support Unit or the Learning Technology Hub will be happy to help. UBC has signed the final contract with Instructure, the company that developed Canvas. We're now in the process of rolling out Canvas as the core of UBC’s Learning Technology Environment. Select UBC faculties will be transitioning a number of courses from Connect to Canvas for September 2017, and by September 2018 all courses previously taught in Connect will have transitioned to Canvas. To prepare for this transition, the UBC Learning Technology (LT) Hub has been working to configure Canvas, finalize the process for moving content from Connect (Blackboard Learn) to Canvas, and integrate Canvas with UBC systems (such as the Student Information System) and external learning technology tools (such as iClicker). Numerous online and in-person Canvas training and support resources are now available to faculty, including workshops and open studio time offered at UBC Vancouver and UBC Okanagan. UBC is also in the process of hiring Canvas Tech Rovers who, starting in September, can support faculty, TAs, and staff with the transition from Connect to Canvas. If you have questions about Canvas or about moving over course content from Connect, please reach out to your faculty’s Instructional Support Unit, or contact the Learning Technology Hub (Vancouver) or the Centre for Teaching and Learning (Okanagan) at ctl.ubco@ubc.ca for assistance. We are pleased to announce that following extensive consultation and evaluation, UBC has selected the Canvas platform (by Instructure) as the replacement for Connect. A range of support resources to help faculty, staff, and students navigate this transition effectively will be available. Over the course of the next few weeks, we will continue to update this page to include additional information on support resources. Specific questions about the product, the timetable, or the support available to you should be directed to lt.hub@ubc.ca for UBC Vancouver and to ctl.helpdesk@ubc.ca for UBC Okanagan. Canvas is a learning management system (LMS) designed for mobile and will provide expanded capabilities as well as a more user-friendly interface for faculty, students, and staff. If you would like to explore on your own, you can visit the Canvas Community to access tutorials and guides. We have also put together some FAQs and overview about specific functionality. We are in the final stages of negotiation and we anticipate that the new system will be made available for development of courses at the start of July 2017. The first courses will be offered in Canvas this September, with all courses migrated to the new system by September 2018. We are officially wrapping up the Pilot phase of the LTE Renewal project and, after a successful Request for Proposal process, we are currently negotiating a contract with the preferred vendor and expect an announcement to be made to the UBC community in the next two to three weeks. In the meantime, the LTE Renewal team are meeting with Faculties to determine their priorities for implementation between September 2017 and September 2018 and the additional support required in moving forward. We have developed a "Spring Cleaning" process to assist you in preparing your Connect course content for migration to the new system. Information for how to opt-in can be found at here. We have also scheduled some professional development opportunities for faculty who are moving their courses for September. Registration for all workshops at the Vancouver campus is available through the CTLT Events website and registration for workshops at the Okanagan campus is available through the CTL Events website. The LTE Renewal evaluation committee reached a unanimous decision to recommend both D2L (Brightspace) and Instructure (Canvas) move to a directed RFP (Request For Proposal). This recommendation was put to the IT Advisory Committee (ITAC) on March 7th and to the UBC Executive late last week and has now been accepted. The RFP was released on March 22nd, launching the next phase of the process, and responses are due from both vendors on April 5th. The committee will have one week to evaluate the proposals and to select a preferred vendor. Negotiations will begin with the preferred vendor immediately following the selection. The results of the RFP phase will be presented to the UBC Executive and the Board in mid-June and announced to the wider community after that meeting. The news will be posted here and distributed widely via other channels. In the meantime, we are meeting with Faculties to determine their priorities for implementation and the additional support required in moving forward. Following the vendor presentations, drop-in sessions, and an extensive collection and evaluation of feedback from faculty, staff, and students who have tried out Brightspace and Canvas, the evaluation committee is now considering their recommendation about the next stage of the LTE Renewal project. The committee is expected to announce their recommendation by the end of March, and this choice will indicate if one system has been determined to better meet UBC's qualifications or if both systems are still being considered as possible replacements for Connect. The news will be posted here and distributed widely via other channels. Thank you to everyone who has contributed input to the evaluation process so far. Faculty and staff, if you had a chance to try out one or both of the LTE core candidate environments (Brightspace and Canvas), we invite you to fill out the official survey (link removed, as survey has closed) summarizing your experience with these systems. This survey will be open now until the end of the day on **Friday, February 17** (date extended), and we welcome all thoughts and opinions as we move toward the next phase of the Learning Technology Environment Renewal project. You are also welcome to send feedback and questions directly to the LT Hub at any time. As part of the Learning Technology Environment Renewal Project, representatives from Instructure (Canvas) and D2L (Brightspace) will make a public presentation during the reading weeks in February, one on each of the Okanagan and Vancouver campuses. Presentations are scheduled over a three-hour period. Faculty, student, and instructional support staff feedback and exploratory sessions informed the script vendors received and will comment on. The use cases and questions to be addressed are available here [PDF]. If you have more questions you would like addressed in this session, please email the LT Hub. Community members who are unable to attend the presentation on their campus will be able to view a live stream of the other presentation, and there will be an opportunity to submit questions virtually using Slido. In addition to the presentations, representatives of each of the vendors will be available for a full day to any faculty member, student, or staff member who wishes to ask questions about the system. Faculty, attend one of our exploratory sessions to get a hands-on introduction to Canvas and Brightspace. These sessions will include a short presentation, hands-on support and guidance for exploration, and an opportunity to give your feedback through a guided group discussion. Explore both Brightspace and Canvas in either of these 2-hour sessions. Coffee refreshments provided. Please bring your laptop. Maximum 16 participants per session. Students, please join us for usability testing in Irving K. Barber Learning Centre and the Okanagan in late January and February. You'll get a chance to try one of the potential tools to replace Connect (Canvas and Brightspace) in a mock course and give your feedback on the experience. Plus, with just 10-15 minutes of your time, you'll receive a full-sized candy! Not able to attend? No problem! Interested students unable to join the testing sessions can email the testing team to arrange for individual testing times (held in person or online, depending on your location). Faculty and staff, if you are interested in trying out the new LTE core candidate environments currently being piloted (Brightspace by D2L and Canvas by Instructure), email lt.hub@ubc.ca to request access to sandbox courses. Please note that sandbox courses are only for exploration purposes and should not include any student enrolments. Also be aware that both environments have at least some components hosted outside of Canada (while Brightspace is hosted in Canada, some of the tools are hosted outside). The project team will be seeking feedback about your experience of using the environments. Shortly, we will be advertising exploratory sessions that will support a guided exploration of the environments and provide a forum for structured feedback. We will also be publishing a survey to capture additional feedback later in the term. In the meantime, please feel free to send feedback directly via the web form. If you have any questions about the functionality, or need help to navigate the environments, please feel free to reach out to the LT Hub, either by email (as above), phone (604.827.4775) or drop-in, Irving K. Barber Learning Centre room 2.27. The RFQ (Request For Qualifications) closed on Wednesday, November 23, 2016, and two vendors were invited to participate in Stage 2. These vendors are Instructure (Canvas) and Desire2Learn (Brightspace). Both these vendors were on campus from December 6-8 for a hands-on "Work Party" with faculty of the pilot courses. The Work Party focused on the vendors' understanding of pedagogical approaches as well as their ability to work collaboratively with faculty, staff, and students. After an evaluation of the Work Party, both vendors were invited to participate in Stage 3 with five courses being piloted in each system in 2016 Winter Term 2. Over the course of Term 2, we will gather feedback from faculty and students in the pilot courses. As well, we will provide the opportunity for users outside the pilots to access sandbox courses and provide feedback. In mid-February, the vendors will be visiting both UBC campuses for presentations to faculty, staff, and students. At the conclusion of Stage 3, a decision will be made regarding the next stage. If a new tool is selected, implementation will begin in the 2017/2018 academic year.